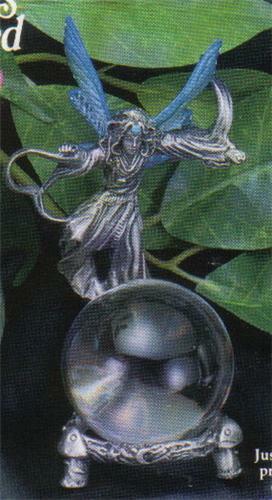 A Delightful Fairy Angel Hand Painted - Pewter Figurine. Her name is Moonlight. Moonlight opens the way to the future by gazing into her crystal ball. Congratulations, your future looks bright and shiny and full of promise. This piece is very well done. She is 4 inches tall and 2 & 1/2 inches wide. She is decorated with two colored stones and a crystal ball.